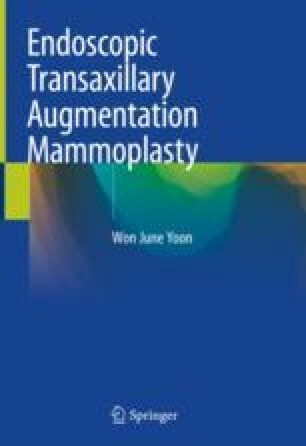 In the case of augmentation mammoplasty using axillary incision, it is appropriate to perform the operation under direct vision, and in support, the endoscopic system is utilized. The endoscopies available for augmentation mammoplasty are relatively limited in variety and technological advancement compared to endoscopy in other fields, therefore the limitation in the selection of scope to use to perform the procedure. In the future, the improvement of endoscopic scope and endoscopic instruments will be necessary, and, furthermore, such developments will sufficiently contribute toward the advancement of augmentation mammoplasty.